Mark Hadlow, a New Zealand theatre icon, returns for a final season in Auckland as the most polarising of species – a middle aged man in lycra: a MAMIL. You’ve seen them … maybe you are one of them … one of those cyclists who swap sports cars for super bikes and swarm our roads in body-hugging outfits, revealing all, wearing streamlined helmets. Back by popular demand, MAMIL will have you laughing yourself giddy at this solo theatre show about one man’s adventure as he transforms from stressed-out property developer to health-conscious road warrior. Written and directed by Gregory Cooper (That Bloody Woman), don’t miss this hilarious exploration of colourful Kiwi characters. 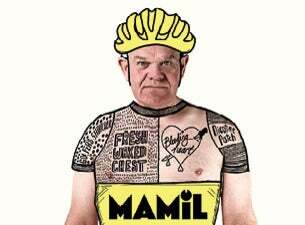 Poignant and achingly funny, MAMIL presents the male mid-life crisis in all its lurid glory.